Designed with the latest technologies and most advanced techniques, OptiKits! buildings perform. Each building takes less effort and cash to inventory, cut, stage, and construct for the best square footage yield possible. Building packages optimized to save time and money start to finish. Just drive and fasten, very little cutting required. If your permitting office requires engineer stamped plans we can do it. OptiKits! are engineered pole barn kits that save time and money. We provide online pricing for buildings up to 60′ wide with snow loads of 55 psf or less, wind speeds 90 mph or less. Same day pricing for other conditions and sizes available by contacting us for a free no obligation quote. Our optimized pole barn kits are perfect for farm and ranch. From hay barn kits to horse barn kits you will find OptiKits! perfectly suited for your needs. OptiKits! are a modular design concept based upon 9′ on center post spacings and truss spacings of 4′ 6″ on center for low snow load locations and 3′ on center for heavy snow loads. Horse barns with 12′ stalls make perfect OptiKits! too. These are offered with 12′ on center posts and 4′ on center trusses. Pole barn kits make fantastic garages. OptiKits! are ideal for this purpose since they provide the most square foot of space for the least effort. Need second floor storage? We can provide building packages with attic trusses or floor trusses tailored specifically to your needs. If you need engineered prints we can include that in your quotation, just let us know. We build in many areas and will provide an erected quotation including installation of doors, windows, cupola and optionally a concrete slab or wood flooring system. Great for RV storage, that antique car you love, or large commercial storage buildings, OptiKits! perform. Designed for rapid construction and to minimize mistakes for DIY construction, seasoned contractors love less work in the corners and fewer items to cut and stage. We build commercial cold storage, pavilion structures, and insulated commercial buildings. We are competitively priced in the marketplace providing top quality products on small or large jobs. With over 22 colors available for steel siding, roofing, and trims you have plenty of choices. Color chips can be mailed to confirm siding, roofing, and trim colors blend nicely. Our online design center provides pole barn prices instantly and features design capabilities not found anywhere else! It’s quick, it’s easy, so give it a try today! OptiKits! are specified with premium lumber. #1 lumber is used for all truss supports, door headers, and skirt board. You get top quality steel siding and roofing and excellent quality doors and windows. Fewer lumber sizes to keep track of and stage. As close to stage and assemble as an erector set. 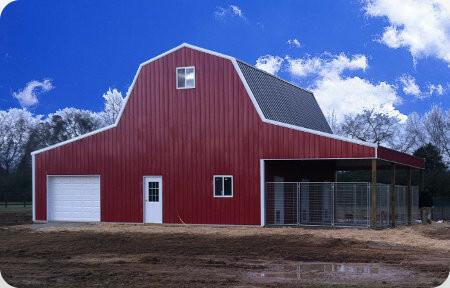 Enjoy the benefits of the modular design of our pole barn kits for your project. Less mistakes to make, less lumber and steel to cut, easier floor plans and lightning fast construction due to the modular design of our pole barn kits. We are here to help! We offer free construction technical support if you have questions about anything at all. We are interested in our customers projects. Our quoted prices include delivery to your jobsite. Trucks include unloading equipment. Materials are shipped from select suppliers around the country. Our sales office is in Texas so sales anywhere other than Texas are invoiced with no sales tax. Obtain delivered prices for pole barn kits suitable for garage, farm building, or storage applications. Options are available for size adjustment, insulation, doors, windows, eave lite panels, cupolas and more. Standard kit pole barn prices. We erect buildings, install doors and accessories, and pour concrete slabs to our customers’ satisfaction. Our crews build fast and care about the quality of work performed. After designing a barn kit contact us for turnkey installed cost. For more information about our pole barn builders division please visit our barn construction services. We provide custom barns, garages, and commercial buildings with premium quality materials combined with industry leading craftsmanship. You get more for less. If you need engineer stamped structural plans we can include them in a building package or turnkey installed pole barn. Call (210) 650-2276 Monday-Friday from 8:00am – 5:00pm CST or drop us an email using this form. If you want a call back please include your telephone number in the message.